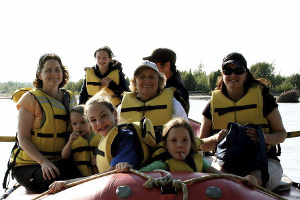 Our family owned/operated business takes pride in providing a personalized float tour to all of our clients. Float tours are enjoyed by most age groups. Summer days are often quite warm, but a breeze on glacial rivers can be chilly. Therefore, we suggest you bring along a sweater or jacket as well as a hat, camera and sunglasses. Fall days can be very chilly -- please plan accordingly and dress with layers. Tours are guided float tours, which include transportation, rubber boots, rain gear/ponchos, PFD's and water. All of our tours are fully equipped with Coast Guard approved equipment. 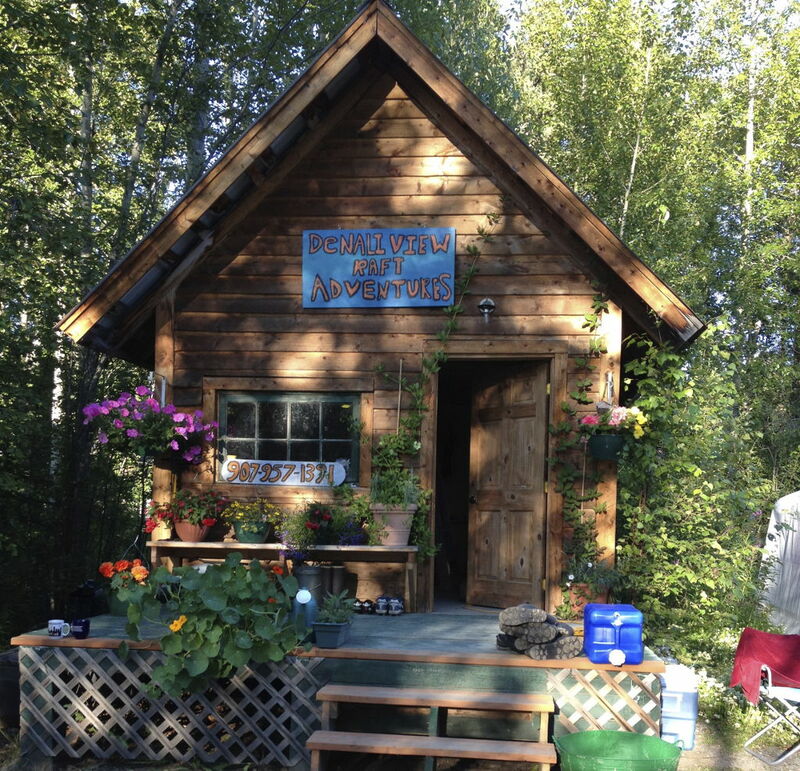 We pickup from the Talkeetna Lodge, Susitna River Lodge, the train depot or downtown Talkeetna. We have plenty space for RV parking at our office location. Our premium tour. 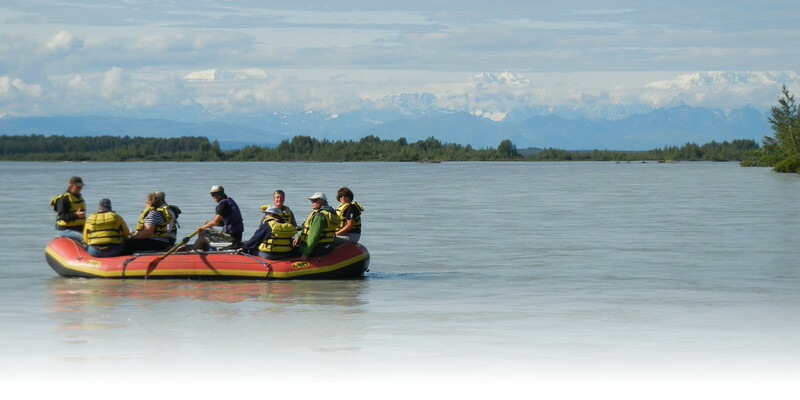 A perfect combination of the last flag stop train in America with a relax raft tour on the mighty Susitna River. From South (Anchorage): Follow AK-Route 1 (Glenn Highway North) for approximately 40 miles. Continue onto AK-Route 3 (George Parks Hwy) for another approximately 60 miles. At milepost 99 take a right on the Talkeetna Spur Road. The Talkeetna Spur road is 14 miles long and ends in the town of Talkeetna. Around mile 13 the road crosses the rail tracks. Look for our sign on the right side of the road within 0.5 miles of the crossover (just before the Talkeetna Camper Park). From North (Denali National Park): Follow AK-Route 3 (George Parks Hwy) South. At milepost 99 take a left on the Talkeetna Spur Road. The Talkeetna Spur road is 14 miles long and ends in the town of Talkeetna. Around mile 13 the road crosses the rail tracks. Look for our sign on the right side of the road within 0.5 miles of the crossover (just before the Talkeetna Camper Park). 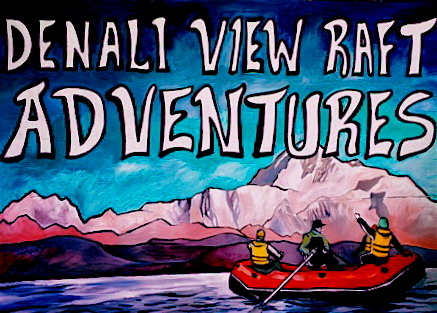 Denali View Raft Adventure is locally owned and operated, by Matt Kaso and Heather Collins. We are both born and raised in Alaska. Matt in Talkeetna and Heather in Juneau. Matt began his river rafting career well before he graduated from High School eventually guiding whitewater trips on Eagle River, and overnighters for most of the summer on the Chulitna. His life long love affair with rivers eventually let him to help the original owners of Denali View Raft Adventures form their business. Matt has been a river guide for DVRA since the beginning. 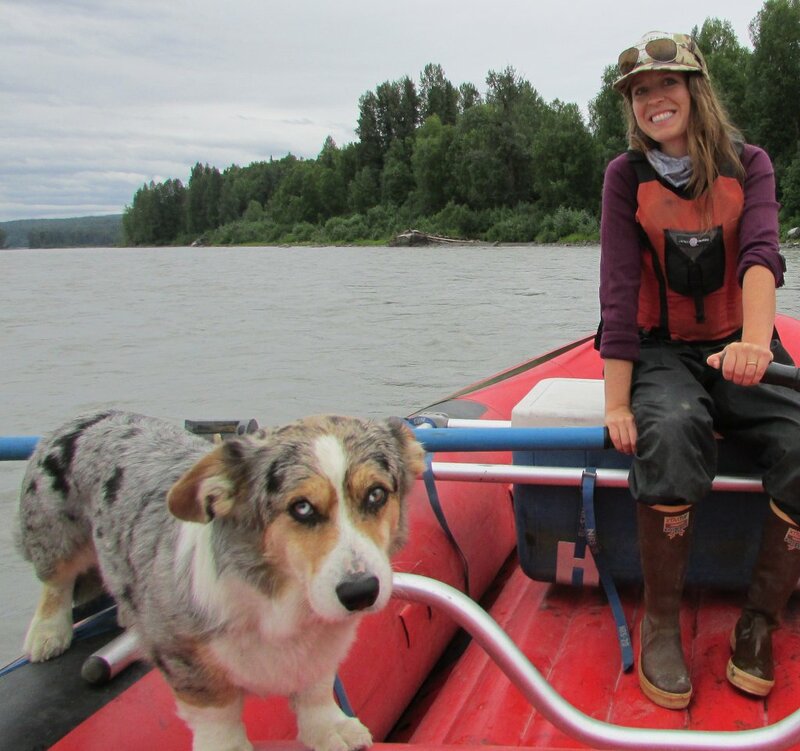 Heather grew up in Juneau Alaska, where she started working in tourism when she was 17 as a State Capital Building tour guide, Princes Tours staff and eventually for TEMSCO Helicopters as a glacier guide. 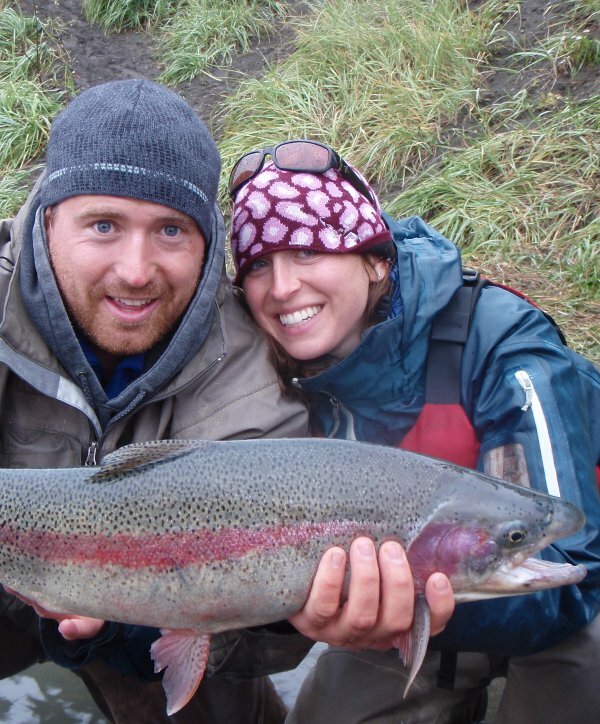 In 2005 she met Matt and he introduced her to river guiding and Talkeetna. Frank; is a cardigan welsh corgi, our best friend, and Denali View Raft Adventures mascot. He has an unquenchable thirst for rafting and zest for life that knows no bounds. If you meet him, he’s friendly, loves pets, barking, and hanging out with all of our awesome guides!! Feel free to give him a scratch he’s very sweet. 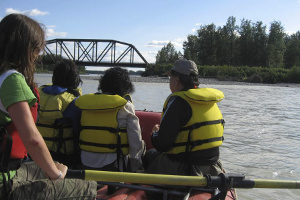 In 2011 we took over Denali View Raft Adventures and enjoy showing off our beautiful area thru the natural setting of the rivers. We look forward to meeting visitors and locals alike who jump at the chance to experience these awesome rivers. In the off season you can usually find us fly fishing for rainbows, skiing powder, climbing peaks, running rivers, or plotting some outdoor adventure!